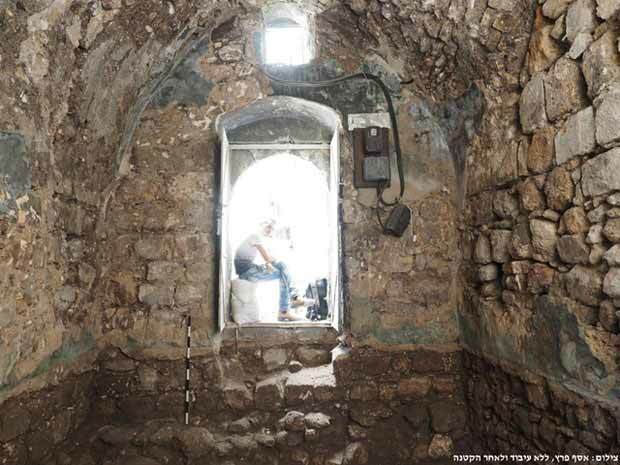 In June 2016, a salvage excavation was conducted in Khan al-Sultan in the Old City of Jerusalem (Permit No. A-7739; map ref. 222009-17/631614-22; Fig. 1), prior to development work. 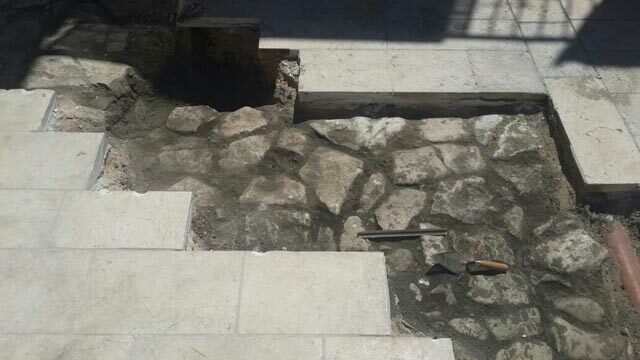 The excavation, undertaken on behalf of the Israel Antiquities Authority and financed by Mr. Omar Abdin, was directed by D. Yeger, with the assistance of N. Nehama (administration), R. Cohen and E. Kagan (antiquities inspection), A. Hajian, Y. Shmidov and V. Essman (surveying), D. Tanami (metal detection), A. Peretz (field photography), A. Goel (numismatics), I. Lidsky-Reznikov (pottery drawing), I. Raznitsky (metallurgical laboratory), C. Amit (studio photography), N. Zak (drafting), B. Dolinka (pottery reading) and N. Sapir (Old City district archaeologist). The entrance to Khan al-Sultan, on Shaʽar Ha-Shalshelet Street in the heart of the Old City, is located near the intersection with Shuq Ha-Zorfim Street (Fig. 2). A covered passageway connects the khan with the street (Fig. 2:a). On its western side is a doorway leading to a narrow covered street flanked by two rows of bays that served as shops (Fig. 2:b; this part is currently a public restroom). Extending north of the covered passageway is Market Street, which is vaulted to a height of two stories (Fig. 2:c). On its eastern side is a row of bays and to the west is another row of small rooms in the center of which is a doorway that leads to a wide hall that served as a stable (Fig. 2:d). An upper gallery on Market Street leads to another row of cells on either side. At the end of Market Street is a tall archway that opens to the khan, in the center of which is an open courtyard surrounded by two tiers of chambers (Fig. 2:e). The upper story of the khan is reached via two staircases, in the southeastern and southwestern corners of the courtyard (Fig. 2:f). The vaulted structure and Market Street were built or renovated in the Crusader period, whereas the khan was constructed in the Mamluk period. This determination is based on an inscription (now lost) documented on the arch on the eastern side of Market Street. 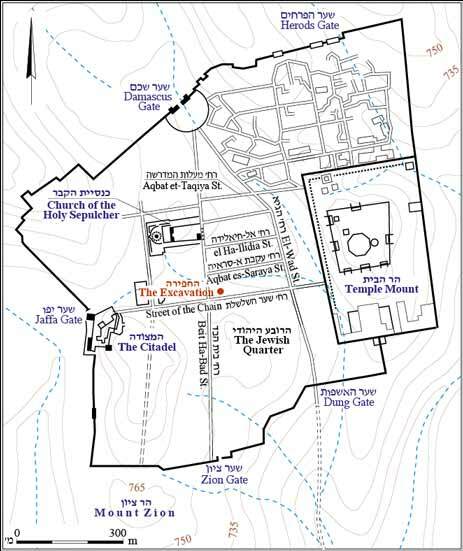 The inscription states that the qaysariyya (the market hall) constituted an endowment (wakf) for the Haram (the Temple Mount Compound) and was renovated by Sultan Barquq in 788 AH (1386–7 CE). Mujir al-Din (1497 CE) calls the khan a wakala—a place where taxable goods were stored. Its plan is characteristic of urban khans in other city centers of the period such as Cairo, Damascus and Aleppo. The ground floor was used to store merchandise and distribute it to the local inhabitants, while the upper floor was for accommodation (Burgoyne 1987:479–484). The khan served as an endowment for the Al-Aqsa Mosque; in the fifteenth century CE, it yielded an income of 400 dinars per year. At the beginning of Ottoman rule, the Dome of the Rock was made the beneficiary of the endowment (Lutfi 1985:124). The current excavation was conducted in the northeastern room on the ground floor of the khan. 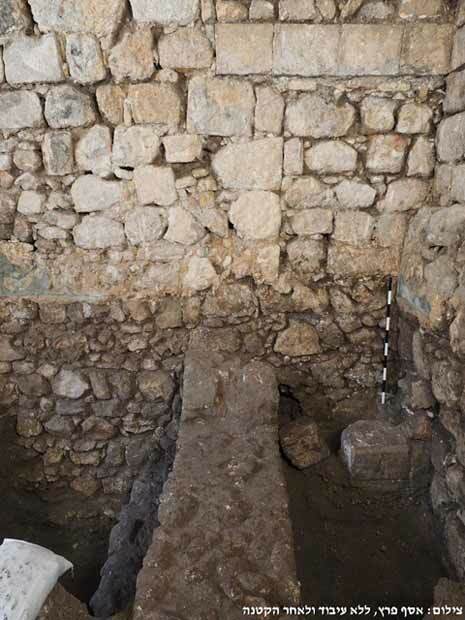 During antiquities inspection prior to the excavation, soil fills were removed until ancient architectural remains were revealed after which an excavation square (1.5 × 3.0 m) was opened in the northeastern corner of the room (Fig. 3). The strata presented below are from the earliest to the most recent. Stratum IV—The Fatimid period (eleventh century CE). A wall (W2; length 3.5 m, width 0.7 m, preserved height 0.8 m) aligned north–south was exposed; it was built of roughly hewn stones bonded with gray mortar. In W2 was a blocked and plastered arch with a low span (Fig. 3: Section 1–1). An earlier wall (exposed depth 1.2 m; Fig. 4) built of fieldstones bonded with hard, light gray plaster that protruded 0.4 m from the line of the wall probably served as a foundation; however, this could not be ascertained due to the limited scope of the excavation. Brown-gray earthen fill (L14) abutted this foundation and yielded numerous ceramic finds dating to the Abbasid (ninth–tenth centuries CE) and Fatimid (eleventh century CE) periods. A Seleucid coin (second century BCE, IAA 158797) was also recovered from this stratum. Apparently, W2 continued north and south beyond the limits of the room and the excavation. Stratum IIIb—The Mamluk period (thirteenth–fifteenth centuries CE). The top of W2 was destroyed, and one of the rooms in the khan was constructed on top of it (W11, W12, W18, W19; Fig. 3). 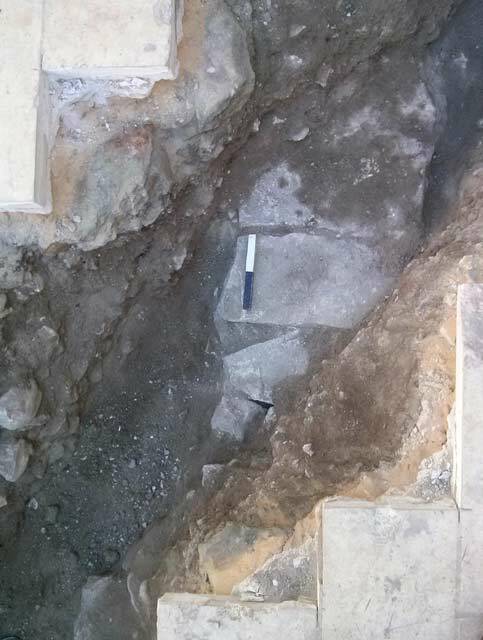 A tamped soil level (L6, L16) was found between the foundation of W2 and the foundations of W11 and W12, and above it was soil fill that covered the remains of the top of W2 (L4, L8, L9, L17). A coin (IAA 158796) dating to the fourth–fifth centuries CE was found in this stratum. The southern and northern sides of the room in the khan were covered by a barrel vault and a cross-vault respectively. The vaults were constructed of fieldstones and gray mortar containing black and white inclusions. The walls of the room were built of square roughly hewn medium-sized stones bonded with gray mortar with black and white inclusions. At the top of W12 was a course of ashlars whence the cross-vault sprang. The opening of the room facing the courtyard was in the center of W18; a step on the inside of the doorway connected the level of the courtyard to the floor of the room (Fig. 5). A window above the opening facing the courtyard served for ventilation and allowed light to enter the room. It was impossible to determine if the window dated to the time the room was constructed—in the Mamluk period—or later. The original threshold stone and the room’s floor were not preserved. A joint was discerned at the point where W2 and W12 met, where W2 was preserved to a height of nine courses (Fig. 6). Stratum IIIa—The Mamluk period. 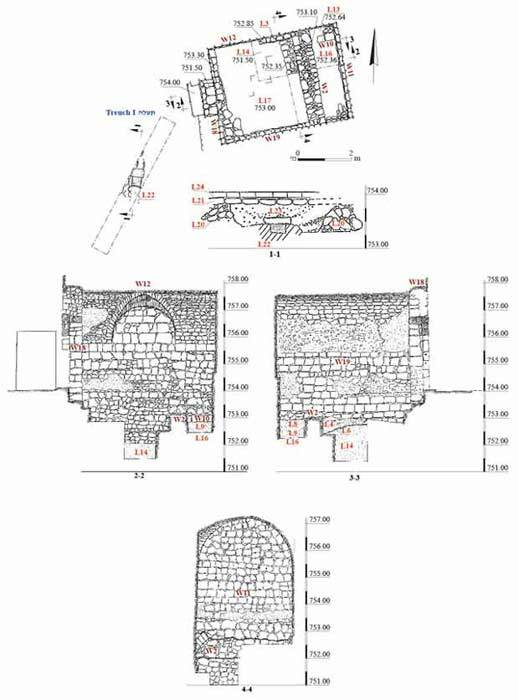 An installation delineated by two dressed stones in secondary use (W10) and filled with small fieldstones (L13) was found in the northeastern corner of the room. Another installation built of a row of fieldstones bonded with gray mortar containing black and white inclusions (L3) was constructed next to W12. Stratum II—The Ottoman period (fifteenth–twentieth centuries CE). The floor of the room was raised with soil fill to the present threshold level (the fill was removed during antiquities inspection). Stratum I—The modern era (twentieth century CE). A new entrance threshold was built of concrete. Two trial trenches were documented in the khan’s courtyard. Trench I. Several phases were discerned. The floor of the courtyard consisted of medium-sized flagstones with small wadi pebbles in between (L21; Fig. 7); it was founded on top of a fill of brown-gray soil and stones (L20). Potsherds dating to the Mamluk period were collected below this floor. It is possible that a drainage channel (L22) that severed the bedding of the courtyard (L20) was installed when the courtyard was paved or during a later phase. The channel, aligned north–south, was covered with stone slabs and its sides were built of dressed rectangular stones (inner width 0.4 m, outer width 0.8 m, depth 0.25 m, exposed length 1 m; Fig. 8); it was covered with gray-brown earthen fill (L23). At some point, the channel ceased to be used and filled up with an accumulation of loose gray soil. A new floor of limestone slabs (L24) was constructed atop the earlier floor during the twentieth century. Trench II. Remains of the earlier floor of the khan’s courtyard (L21) were exposed. Below these remains was the top of another channel that ran parallel to Channel 22 (L25; Fig. 2). 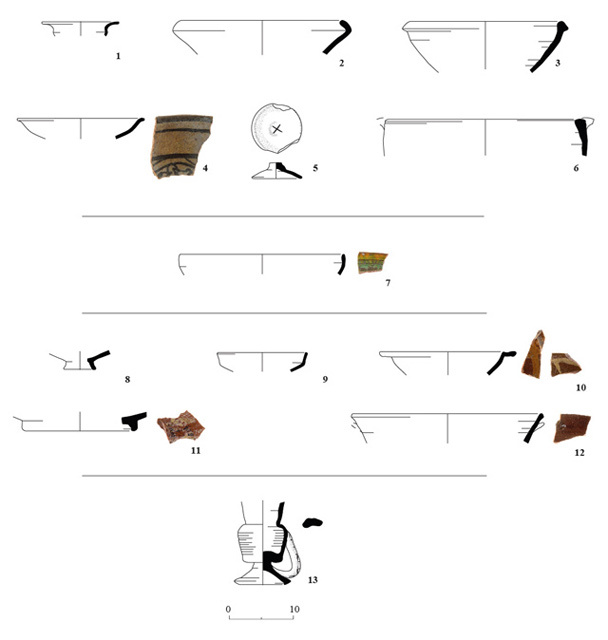 The ceramic finds from the excavation date to the Early Islamic, Crusader–Ayyubid, Mamluk and Ottoman periods and include bowls from the ninth–tenth centuries CE (Fig. 9:1–3), a Kellia Coptic painted bowl (Fig. 9:4), a lid (Fig. 9:5), a krater (Fig. 9:6)—all from the ninth–tenth centuries CE, a Serçe Limani Ware bowl from the eleventh century CE (Fig. 9:7), bowls from the mid-twelfth–mid-thirteenth centuries CE (Fig. 9:8–10), an Aegean Ware bowl from the thirteenth–fourteenth centuries CE (Fig. 9:11), a fry-pan from the thirteenth–fourteenth centuries CE (Fig. 9:12) and the upper part of an Ottoman samovar (Fig. 9:13). 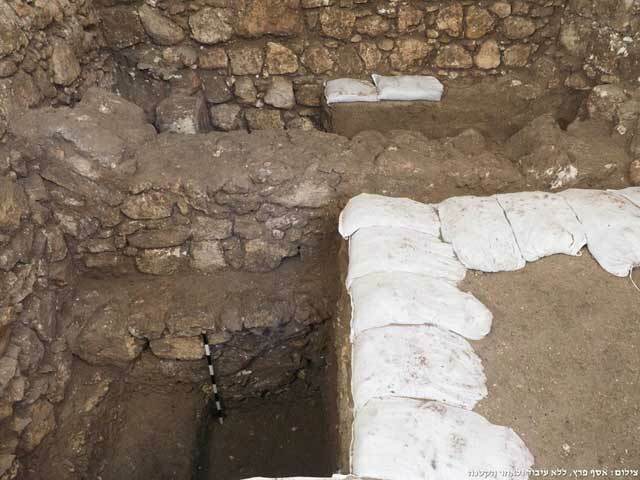 Despite the limited scope of the excavation, it was possible to ascertain that during the Fatimid period (eleventh century CE) there was a building in the compound, of unknown purpose. There may have been a connection between the building and the adjacent covered passageway and market to its south (Burgoyne suggested it antedates the Crusader period). The khan was erected later, on the remains of the ancient building, during the reign of Sultan Barquq. The channels exposed in the courtyard of the khan could not be dated with certainty to the Mamluk period. They probably postdate it. 2. General plan of the khan and the excavation area based on the ground floor plan of Khan al-Sultan, from Burgoyne 1987:480–481. 4. Wall 2, looking east. 5. The entrance to the room, looking west. 6. The joint between Walls 2 and 12, looking north. 7. The courtyard pavement (L21), looking west. 8. An ancient channel (L22), looking north.